Stay in downtown Toronto and treat yourself to a full house for your full family! There is even a parking spot included. There are stairs! If you are afraid of stairs, please let us know. We do not recommend our place to anyone with a mobility challenge. There are 5 levels to our house. On the bottom floor, the Mark Hamill suite will delight your inner geek with its Star Wars themed decorations, the 4K LED TV, the Xbox 360, and an Apple TV hooked up to Netflix. The mini apartment has its own on suite bathroom, a pink couch (that folds out as well) with a coffee table for geeks who want to entertain other geeks (or geekettes! We are equal opportunity labelers). A queen size bed rests in a side nook, with a tiny death star lamp hovering nearby, ready to extinguish a tiny dreaded Rebel Alliance once and for all. The main floor encompasses the main entrance, the kitchen, the living room and a dining room. Our kitchen is equipped and ready for your cooking needs. We have a gas stove/oven, so if you like your home cooked meals to taste “flamey", you are in luck! A stainless steel fridge is also waiting for you, with a big freezer for those looking to preserve and protect (meat). 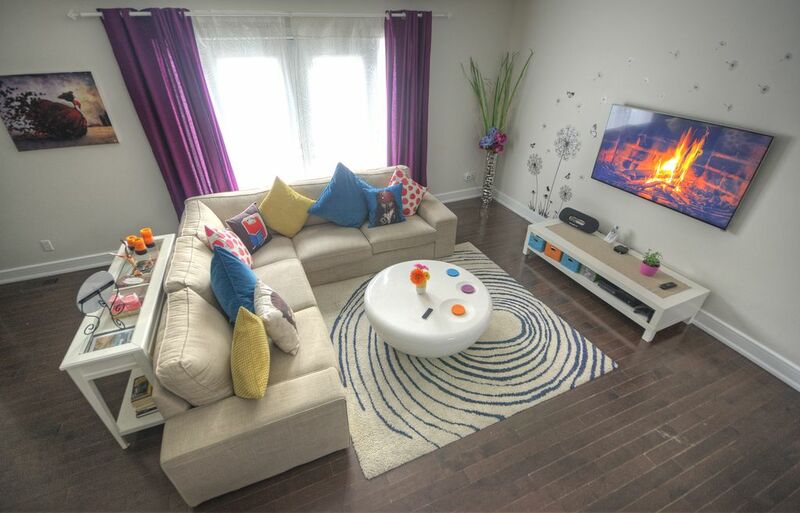 A 55" LED TV faces the couch and the round coffee table, and it is hooked up to a 4th generation Apple TV. We have Netflix hooked up and we can change the Netflix's country catalog on demand to whatever country you want. The ad-free premium version of Hulu can also be found on the Apple TV, plus a lot of other goodies, like the BBC iPlayer, Channel 4, and more. Did I mention we are geeks and we love technology? We also have an Xbox One with tons of games in the living room, and by tons, I mean TONS. It has two controllers, ready to take your sibling rivalry to new levels. Under the skylight in the corner a dining table that seats 6 is waiting to be filled with pizza boxes and inexpensive Asian takeout containers. This is a busy floor! There are two bedrooms here. One is what we call “The Romantic Room", mainly because of the curtains which seemed romantic to Vanessa when we were decorating it. The first bedroom sports a queen size bed and a cute dressing table with a mirror. The room also has a sizeable walk-in closet that is ready to receiving the day's shopping, or it can also store your luggage, a mariachi band and 9 bernese mountain dogs. Yes, its that big. The 2nd bedroom on the 2nd floor is what we first intended to be the kids-room-but-also-adults-can-sleep-here-too room. It has bunk-over-full bed and kids toys, and a tiny carpet to play with your hot-wheels cars. The bottom bunk is big enough to sleep two sized adults comfortably. There is a closet in the corner, but it isn't the walk-in type. You can walk into it, but then you're just a person in a closet. Which is fine. We love you. There is a bathroom as well on this floor with a bathtub and a sink (thank you mr.obvious). The floor also has a washer and a dryer, for the washing and drying of your clothes. European travelers – most of you have never used a dryer, but you will love it! It's the North American way of drying clothes, at a steep cost, rather than drying them by hanging them outside the window, for free. The third floor of the house comprises of one massive master bedroom. A king-size bed will ensure you are rested for the day of adventuring that lies ahead. In the corner, on the desk, a wireless duo-tone laser printer, a capsule based coffee maker so you can make your own drinks without having to go down to the kitchen, and an iMac for you to browse on. Did I mention we're techno nerds? A 46" LED TV with an Apple TV hangs on the far wall. You can watch Netflix or Shomi from bed, both offering thousands of movies and shows at your fingertips, while you order imaginary servants to fetch you exotic delights, guaranteed never to arrive. There is an on suite bathroom with a fancy shower apparatus and a his-and-hers or his-and-his or hers-and-hers sinks. For shop-o-holics, there is also a large walk-in-closet for your luggage, shopping etc - but please don't store your kids in there, its not an actual room. The roof deck is a roof type deck roof-place, an outdoor open area with a picnic table and a BBQ. It is a magical place to spend the summer days with 12 of your closest friends, watching over the city lights, sipping sangria and listening to The White Stripes being angry about something or other. 4 bedrooms, 3 bathrooms, and a rooftop patio with a BBQ. A fully equipped kitchen, TVs, Xbox, unlimited internet, an office, a printer and other goodies. A parking spot. Sadly, unless you insist we move in with you for the duration, we will only interact enough to check you in or if you invite us over for cocktails. We like cocktails. Welcome to the Village! Home to a thriving mix of restaurants, cafes and clothing stores and ground zero for the annual Pride Week. With some of the finest martini bars and restaurants in the city, The Village is the spiritual home of the LGBT community. The house is located 13 minutes walk from Dundas Square and the Eaton Centre, and the PATH, the largest covered shopping area in the world (33KM!). You also have Allan Gardens 30 seconds walk away. Kensington Market is a 10 minute street car ride away, or 30 minute walk. Loblaws at Maple Leaf Gardens is the closest supermarket (a very nice one, too!) 4 minutes walk away. There is a cooking school inside where one can enjoy cooking courses. The supermarket is a massive 85,000 square feet. College Metro Station is 8 minute walk away. We have XBOX games for those who like to spend their vacation days locked indoor, wrapped in blankets, eyes glued to the TV. Totally not judging! My wife Vanessa and I have been in the vacation rental business since 2012, and we are committed to ensure all our guests make the best of their time in Toronto. We've have over 100 unique bookings, and we've felt the positive impact that caring can have on the image that our city is portrayed to tourists. We are brand ambassadors for Toronto and we will make it our mission that you enjoy your stay. We bought this property for its location, its size and the amazing rooftop deck. Canadians have a love affair with rooftop decks, as we tend to huddle in little groups, like penguins, and soak up our short stints in the sun. MagicJack landline, free calling in North America. There is modern air conditioning in the house. We live in Canada, so... yes, we do have heating! We will provide all linens. Fast unlimited internet throughout the entire house. Living room with a 4k 55" inch TV, Apple TV and Netflix + other goodies. There is a refrigerator. It will refrigerate things. A full kitchen with everything you need. We will try and provide basic ingredients like flour and sugar and salt to make it easier for short term guests. The dining area is attached to the living room. The rooftop deck will also have a table that can be used for dining during the summer months. Flat screen 4k 55" TV, plus other TV's in the house. iTunes server on the computer in the house. Xbox 360 with a library of games. Large rooftop deck, with a table and outdoor furniture. The house has 4 stories so it would be difficult for someone who is mobility challenged to get around. We stayed here with 4 adults and 4 kids under the age of 5 and it was perfect for us! There were lots of stairs but our kids managed them fine. It is in a great location and there is a beautiful park and playground near by. Hosts were very quick to respond and had a detailed house and neighborhood guide that was very helpful. Would definitely recommend! we had a great experience at the Jarvis house. the kids loved everything about it. as our trip was coming to an end, they didn't want to leave, the house was above and beyond our expectations. loved the stairs as all 8 family members had to take a photo looking down to camera. carport was a tight squeeze for our suburban rental but it got easier as time went on. calin is quick to respond to messages and gave us some great information about what to see around Toronto. we would comeback to the Jarvis house in a heartbeat on our next trip. Very cool accommodations! Loved the decor and size. We had six in our group, which worked nicely. Loved the location. It was quiet, clean, and very nice. Only suggestion we would make is to better light the stairs which leads to three floors. It could be dark and the color of the stairs blended in making it hard to see all of the steps. Other than that, we would highly recommend! Loved the sense of humor of the owners, only wish we had the time to invite them over for a drink! Next time! Cheers! Perfect for a family vacation with school-age kids. Great hospitality and attention to detail. We travelled around and stayed at many places during our trip and this was the best. We had to find a place in Toronto on short notice - the owners were helpful and accommodating. A comfortable home with 4 spacious bedrooms and everything we needed to enjoy our stay. Close to downtown and U of T in a nice neighbourhood. Would definitely stay again the next time we’re in Toronto!